Apply 30% PTPTN Loan Discount For FELDA Settlers' Children. This is a great news. Felda is sponsoring 30% of the National Higher Education Fund (PTPTN) study loan taken by its Felda settlers' children for their diploma or degree at selected/listed higher education institutions in Malaysia. According to Datuk Hanapi Suhad, its director-general said that a year ago they allocated RM16 million for 1,825 students who are the children of Felda settlers'. He likewise said Felda had given RM200 million to many technical and human capital tranning programs at various public and private institutions for 42,059 students from 2005 to 2010. He prior went to a signing ceremony of a MoU with PTPTN in Menara Felda here today. PTPTN chairman Datuk Shamsul Anuar Nasarah lauded Felda's initiative, portraying the move as a part of the National Blue Ocean Strategy. Please print and fill out the form and submit it to Felda Headquaters in Kuala Lumpur. a. 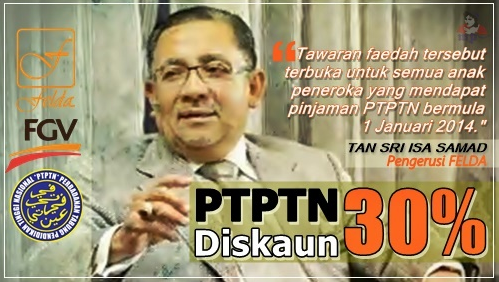 It is open to all children of FELDA settlers with PTPTN loan approved from 1 January 2014.
c. Successful applicants means that FELDA will bear 30% of student PTPTN loan. a. Eligible and interested students should complete the Application Form and submit it to Felda HQ. c. The completed form must be Sent to Unit Jabatan Pengajian Tinggi & Pembangunan Generasi Baru Felda at Felda headquarters in Kuala Lumpur. 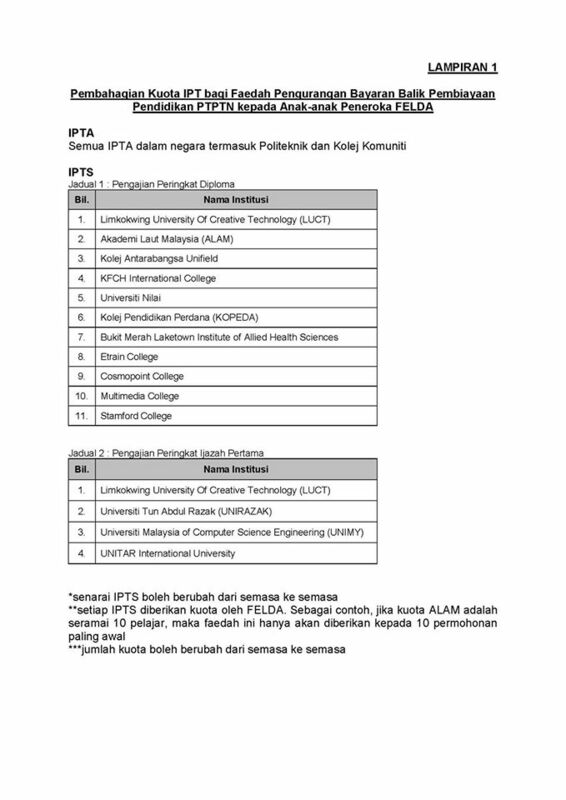 d. For successful applicants check your result at PTPTN webportal. We strongly encourage you to apply for 30% PTPTN Loan Discount For FELDA Settlers' Children. This is a very great opportunity for Felda settlers' children. Good luck to those who are applying.